I'm ripping the old tub out of the bathroom and I got a muscle spasm in my back before dinner which made it very uncomfortable to cook and even worse to eat. The pain made me feel nauseous so I couldn't finish my plate and didn't enjoy what I did manage to eat. Fern felt fine and absolutely loved this meal. When he was finishing his plate he remarked that every meal lately has been a flavour sensation. Well I'm glad the pain didn't produce a standout meal! I sprinkled ground beef with ground garlic, salt and black pepper and formed it into two patties. These were BBQ'd. The vegetable skewers were orange and green pepper, mushrooms and cherry tomatoes. I brushed them with oil and BBQ'd them beside the meat. The rice was basmati with olive oil and salt. 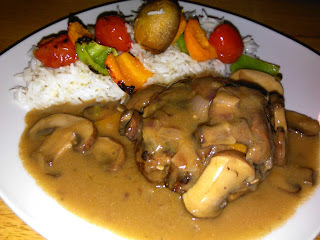 The gravy was a small onion lightly caramelized, remaining pepper pieces diced and sweated and the mushrooms with a good sear. Then remove the veggies from the pan and put one teaspoon flour in pan and add olive oil, a teaspoon or two. Cook the flour taste off, remove from heat and slowly whisk in one cup beef stock. When it's smooth put back on heat and reduce to thicken. Add the mushrooms, onion and peppers back in, add a dash of Worcestershire Sauce and Tabasco and let simmer for a few minutes. Remove from heat and add a slab of butter, stir it in while it melts. Serve. Like I said, it tasted great, I just couldn't enjoy it. Fern loved it.